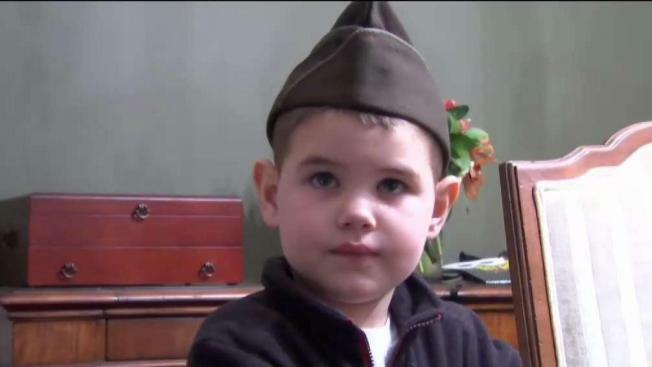 At a time when most little boys only want to play with toy soldiers, kindergartner Owen Zavatone used his birthday to help the real ones. A young Connecticut boy decided to mark his birthday by lending a helping hand to those serving our country. “I want to be in the Army,” Owen said. To celebrate blowing out six candles on the cake, Owen had a special ask of friends at his birthday party. "The idea was for kids to not bring presents for me, but to bring presents for the soldiers," Owen explained. Owen’s request yielded a huge haul of necessities for military members. He’s using the gifts to make care packages. Owen’s mother Maureen Zavatone said her son has a special appreciation for the country’s armed forces you might not expect for someone so young, so they’ve tried to teach him about the valor and the sacrifice of the women and men fighting for our country. "He wanted to have an army party and we always talk about the fact that the soldiers are away from home and they’re very brave," Maureen said. Owen wears a hat that once belonged to his Grandpa Leo when he served. "My papa was in the Army," Own said proudly. Owen’s parents say that his love for the troops extends outside of this house. Whenever he sees one out and about, he always salutes. "We’ve always encouraged him to just show his gratitude to the people that are sacrificing, that are away from their families so we can be with ours," his father Stefan Zavatone said. The Zavatones plan to send the goods from Owen’s party to service members in time for the holidays. In the meantime, Owen has a special message for the men and women who will receive his birthday gifts. “What I would like to say is thank you for your service,” he said.